A 4-in-1 Kicking Tee System for conventional and soccer style kicking. The Toe-Tal-Tee is 4 tees-in-one manufactured in the color black. Mode 1: Ball can be supported at about ground level. Mode 2: When practicing with a holder, flip the tee so the Flat side is up and it?s a 1" Kicking Block for placement kicks (Raised projections to make for a sure hold). Mode 3: In the orientation of Mode 1, insert the tee into the plastic base to create a 1" kick off tee. Mode 4: In the orientation of mode 2, insert the tee into the base and it?s a 1-3/4" Kicking block for placement kicks. The Ground Zero Onside Tee is being introduced in 2004. This new tee, covered by two U.S. 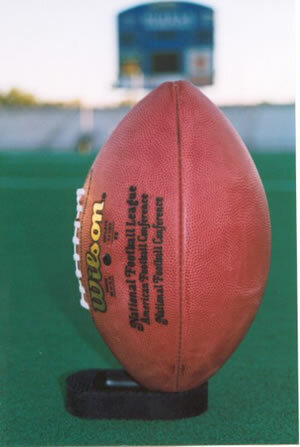 Patents, provides, for the first time, a notch allowing kickers to support the football with its tip on the ground for onside and squib kicks.